The campaign will see Evening Standard vendors dressed in iconic Laurel and Hardly bowler hats across 100 London locations. This will be supported by 500 branded bills and trolley posters advertising the news of the recent BAFTA nomination. Londoners travelling through Charing Cross, Covent Garden or Embankment will also see exclusive snippets of the film where Steve Coogan and John C. Reilly recreate the memorable dance from Way Out West projected on building facades. The campaign across print and outdoor will see 100 ES vendors sharing the evening’s papers dressed in iconic Laurel and Hardy bowler hats and branded t-shirts across key locations with the highest footfall in central London, including Waterloo, Oxford Circus and Leicester Square. In addition, the vendors will be supported by 500 branded bills and trolley posters featuring the news of its recent BAFTA nominations. 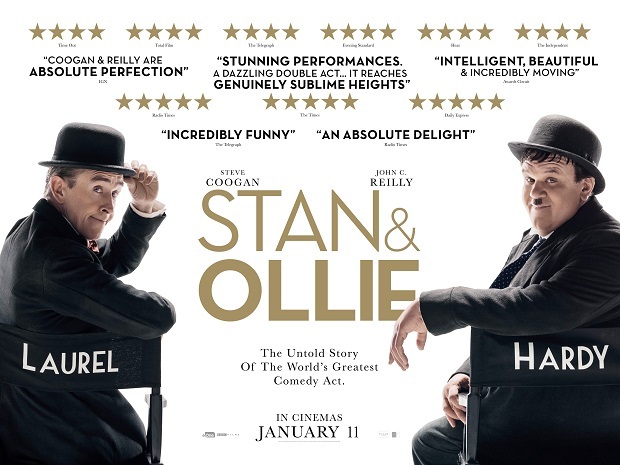 Londoners walking through Charing Cross, Covent Garden or Embankment will also be immersed into the Laurel and Hardy world with snippets of exclusive footage from Stan & Ollie including the recreation of the memorable dance from Way Out West projected onto three iconic London buildings. These outdoor experiential stunts will compliment the exclusive front page advertising to further build brand awareness amongst the ES’ affluent and culture-loving audience. The campaign launches on Thursday 10th January, brokered by Zenith Media with video projections deployed by ProjectionArtworks.